The author of this beautiful brooch “The girl of 1920s” is a London-based former theater artist and designer, Barry Parman. According to sources, he began designing jewelry quite late, in 1970s and worked for a short period. 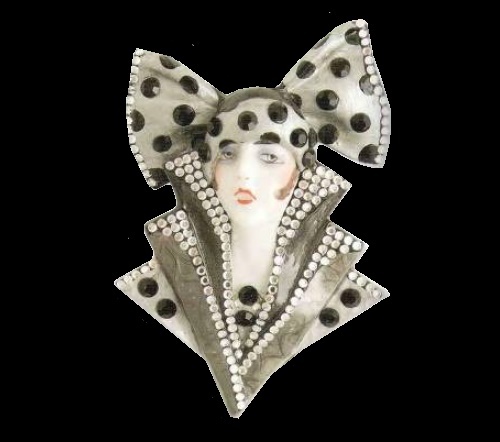 Creating his decorations, Barry Parman used traditional materials – alloys, rhinestones, enamel and crystals. However, even using traditional materials, the artist created truly unique and original designs. Unfortunately, the talented jewelry designer Barry Parman stopped producing costume jewellery due to his death 21 February 1990. Parman designed fine works for leading jewelry dealers, such as Linda Bee. Noteworthy, Barry Parman jewellery pieces are truly very rare and incredibly popular among collectors. Unfortunately, there is little information about the artist. Works by London based jewelry designer Barry Parman, featured in the catalogs of vintage jewelry, are difficult to find.